Nalco Saudi Company Limited is going to commission its second manufacturing plant in Industrial Yanbu on the West coast, this year. This plant, the company says, strengthens Nalco’s presence in Saudi Arabia and is part of its east-west strategy. "Customers will enjoy very short lead-times compared to the previous two days trip from the Dammam plant. It will also provide the technical analytical capabilities long awaited by our customers," says Ala Al Shaikh, company manager, Nalco Saudi Company. Additionally, Nalco Saudi is investing in revamping its delivery fleet with more than eight multi compartmented bulk tankers to add to and replace the existing fleet. Nalco Saudi is part of Nalco an Ecolab company, the leading provider of integrated water treatment and process improvement services, chemicals, and equipment programmes for industrial and institutional applications. For the downstream sector, Nalco is investing to build on its market leading position in the refining and petrochemical markets by bringing several key new technologies into the market. Over the coming 12 to 24 months, Nalco will introduce expansions to its well-known 3D Trasar technology for cooling and steam systems to help customers react in real time to stresses in crude unit overheads. "The 3D’s of 3D Trasar are Detect-Determine-Deliver and describe the technologies unique ability to Detect stress in a given system, Determine the appropriate action to mitigate the stress, and Deliver results immediately before problems occur. Crude unit overhead automation is the newest addition to the 3D platform and is one of the most exciting innovations to come out in the industry for many years. This technology utilises the 3D Trasar concept of Detect, Determine, Deliver to continuously detect the key parameters in the crude unit overhead system, determine the proper adjustments required for chemical additives, and deliver previously unachievable corrosion rates and performance in the overhead," explains AlShaikh. "We are also introducing Nalco’s refined knowledge platform," he adds. Nalco has worked with industry leaders like Microsoft and OISoft to create an innovative and valuable tool to turn refined data into actionable knowledge. Commenting on its business growth during the global downturn, Al Shaikh says that Nalco is very happy with its results given the challenging global environment. "We enjoy a very diverse portfolio of stable customers that allowed us to weather the storm. We were also fortunate in that we continued to invest for the growth and demand that we felt would materialise as the world emerged from the recession. We feel this positions us well in the region to continue to grow," he says. The company sees bright prospects for its business over the coming year. "We are excited about the coming year and expect to continue to realise growth in line with our team, our technology, and our investment in the region. We have invested and built manufacturing capability and people expertise to meet the growth we expect," Al Shaikh says. Nalco is known throughout the world for providing essential expertise for customers in almost every industry. For industries that use water in part of its process, Nalco helps them deal with technical challenges such as corrosion, deposition, and fouling that water poses in their operations in a way that minimises its customers’ environmental impact in the areas of water, energy, and air as well as total cost of operation. In addition to solving water related challenges, Nalco helps many industries such as refining and petrochemical plants process their finished products more efficiently using its chemistries and essential expertise. "We do this by helping the refiner desalt crude efficiently, mitigate corrosion in overheads, and handle fouling challenges posed in their operations. In the petrochemical sector we resolve issues related to polymerisation fouling, corrosion, equipment integrity and efficiency. 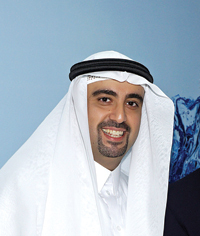 This is accomplished using the latest chemistry and monitoring techniques to ensure maximum on line time and production for the plant," explains Al Shaikh. Nalco has been present in the Middle East for over 30 years. During the last 15 years, Nalco has been heavily involved in all the major projects in the region. During this unprecedented period of growth, Nalco has worked with all the major suppliers and end users to specify requirements and commission almost all of the upstream and downstream capex projects. "The growth provided both opportunity and challenge in meeting that demand. In response, Nalco built a robust supply chain network in the Middle East and network of local on-site engineers and expert consultants for our customers," says Al Shaikh. Nalco has technical offices throughout the Middle East in Egypt, Saudi Arabia, Qatar, Kuwait, Abu Dhabi, and Oman. The company has also invested in resources to service its existing customer base and grow in the future.